This new area of the site has been set up to encourage old site members who have not posted for a while to tell us a little about their new projects. Over the next few weeks I will be sending out emails to past members who we have not heard from in a long time asking them to log on and say Hi. 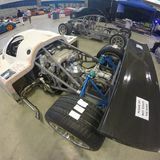 I have made it clear that we, as a group of petrolheads and engineers, always like to hear what people are up to being that Locost related or not and I hope you will all support those who post. To keep this to past members only you must not have posted anywhere on LB for a year in order to start a new thread. However, once a thread has been started anybody can reply to allow the rest of the membership to discuss the post with the author. Current projects: '87 XR2 full restoration, MG ZS 2.0 Turbo conversion, fitting a supercharger to my V6'd MR2......... and a petrol-powered Dodgem! Thanks for this, still have my pile of parts in the garage, life has just gotten in the way of progress . Binned the iffy ST170 Zetec I had planned for my build, started reading up on Duratec/MZR and GM Kappa options. click on the logo in the top left and browse from there, obviously I don't pay attention to the subsections. Time is an illusion. Lunchtime doubly so.................Douglas Adams. And then I spotted an ad in a local classified (I'm in Vancouver, Canada) for a 1975 Ferrari Dino 308 GT4. That was back in 2000 and over these years, I've thought about picking up the Locost project again, but as it was said earlier, life gets in the way. Although interestingly enough, I'm a member of the local Alfa Romeo club and late last year a new member joined saying he was parting out an Alfa Spider as he was planning to build a Locost using the Alfa drivetrain! As I type this, he should be starting the frame build and I'll find out more at next month's meeting. So that's what's up with me. Building: Built-Indy Blade & Fisher Fury R1. Nice one Chris, maybe you could move this then. Haven't visited the forum for years as and car build never got past the planning stage. House move and children soaking up all available funds. I did manage to build something slightly cheaper however, no pesky fuel or electrics to worry about, or paperwork and inspections for that matter. Well, it thought it rude not to drop in and say a few words about what I haven't done! My project started as a Haynes build with not enough prior research else I would've chosen something less rare than a Sierra as a base car. The chassis I started to build is in about the same state as when I last posted but I have offloaded a ton of components that I ended up deeming not worthy of fitting to my car, namely the Pinto engine and 5 speed Sierra box, header and twin 45's. All made damn good money and made me feel slightly better about taking a backward step. Moving forward, the ngine is still undecided but could be a Honda S2000 lump or even something as diverse as a Mazda RX8 unit. The project will be re-started this year that's for sure. In the meantime I have been dreaming about how to fit a 5 litre Mercedes V8 into one of my old Honda Preludes and that has seen me amass 3 of these beautiful engines (M119's if you're wondering) and a load of other bits to make the conversion. I now have a CNC lathe and CNC machining centre to help me on my way with making new parts for stupid projects. That's the condensed version of how things have panned out over the last 12 months of so (maybe 2 years) but, I'm sure a lot of you are all too aware, life really does get in the way of these things. I must admit, I always enjoyed dropping in on this forum despite not contributing much, so I will try and visit a bit more often now. Five years is much to long to be away and I have no excuse for it other than a move, a divorce and all that goes along with each of those things. Some of you may have experience in those areas. But to bring you up to date on my vehicle, design, fabrication and driving activities I offer this brief summery. Following the completion of the Mabaan (LT1 powered, open wheel, Indy style, aluminum, hand shaped body panels and custom chassis) build it became appear ant the I needed a means to transport both the McBearen (Honda v-tech powered, McLaren M8B inspired, hand shaped aluminum body, on custom design/built chassis) and the Mabaan to local tracks located in the S Eastern USA. So I purchased a 28' flatbed trailer and began to fabricate what I call my Club House Trailer. Using the structure and configuration of the flat bed I designed and fabricated everything vertical from the flat. It includes transport space for both cars (McBearen on the top with a winched riser that allows the Mabaan to be ramped up and tucked-in below on the trailers bed. Because I had the space and could, I also fabricated a track-days livable capsule on the front that has sleeping for 4, a full kitchen, shower with heat and air-conditioning ... perfect for relaxing and night accommodations after a days' activity at the track. To date the McBearen has surpassed 50,000 miles and except for the LF fender damage cause by a midnight collision with a deer, it looks almost new from about 25feet. The car has been a prideful ride and other than tires it is as original as it was when I first registered it in 2004. 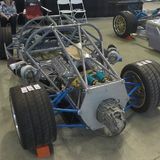 The MaBaan is a rocket and once I finally solved the cooling issue has been a 'winner' for me on the track and at car shows (exhibits) both in the SE and now here in Colorado where I call home. I sold most everything shop related prior to moving to CO and it has taken me longer to re-establish a shop here than I had planned but by late next summer I hope to be back in the saddle, although getting older, there won't be anything built in 14months time, as was the case with the McBearen. I have several ideas and projects in varying degrees of production, from drawings to basic structures that will last me for a while once a facility is operational. It's good to be back and I look forward to familiarizing myself you and your many projects as well as hearing about those that have been completed during my absence. 8 years since I came on your forum, dreaming about to own a Locost... .
Years have gone and the fact that it is really difficult to have papers for a locost in France, I lost my dream to build my own 7... .
Really good idea to send this mail; I already have my books How to build my Locost, and why not... maybe, one day I will build one to race on tracks? well, but what about donor cars, already from a sierra or a younger donor car since 2008 ? Just had a welcome back message so, well, hello. No kits or Locosts here but I have recently bought a cheapie MX-5 to play with. It's good fun, for loose change. Building: GTS W7DE......... very, very slowly! Still have the same kit car. Lay in my father in laws garage for about 5 years and dint really get touched for a about 4 years bar keeping the engine turned over by hand. Finally sorted my own garage roof last summer and done a couple of things to it. Going to advance the project and then sell it as I don't really have the time to enjoy one unfortunately. I didn't realise just how long I've been away from the site. I sold my Locost when we moved down to Cornwall about 3 years ago and have been umming and aaarring for ages about another project. But last year we made a decision to move out to Portugal to be nearer the grandchildren, and bought a place in mid-Portugal and will be moving out there in June. I will also be posting a few bits and bobs for sale soon, build books, gauges etc.